Compassionate Products™ are part of the compassionate evangelism strategy Cru utilizes to provide urban partner ministries with resources for people in need in their communities. This strategy helps expand the ministry of urban churches and Christian organizations through relational evangelism, practically meeting the needs of their communities. Because evangelism is an integral part of Cru's mission, Compassionate Products include Christian literature for children and adults. Urban partner ministries who participate in Compassionate Products are trained in how to effectively use the products in evangelism. Cru's vision is that, through these resources, people in need are being reached out to so they become enfolded into the body of Christ. 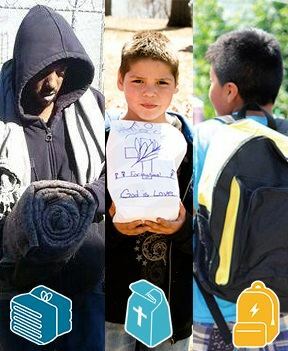 Each kit includes a blanket, warm gloves, a scarf, socks, toothbrush, soap, and gospel materials. These kits often serve as the first step of a spiritual journey for a desperate person. Plain paper bags filled with some of the things inner-city children treasure: candy, fruit, crayons, a toy, a full-color children's activity book about Jesus for children with little church background. Backpacks with school supplies and age appropriate spiritual materials.